Government of India has floated a scheme RGESS (Rajiv Gandhi Equity Saving Scheme) under which taxpayers can get tax benefit for investing in the stock market. This benefit is in addition to regular deduction available under u/s 80C. This Scheme would give tax benefits to new investors who invest up to Rs. 50,000 (or Rs.1,50,000 across three consecutive years) and whose annual income is below Rs. 12 lakh. One of the conditions under this scheme is that there is a lock-in for 3 years and the stocks must be selected from top 100 stocks listed on the stock exchange. Details of this scheme are available at the following link. http://rgess.com/ http://www.bseindia.com/rgess/ http://finmin.nic.in/RGESS/rgess_index.asp We compared the constraint imposed by the scheme and APS recommendations (Rule-ADX). Our first two rules are directly aligning with the constraints. Rule-A suggests investing within top 500 companies while this scheme is asking to invest within top 100. Hence, the scheme constraint is a subset of Rule-A recommended stocks. Rule-D asks for diversity across various leading sectors and top 100 stocks represents all such sectors. Lock-in for three years is similar to our spot scenario (Buy and hold for long period). Our statistics based result (based on Portfolio Builder) suggests such strategy on an average, returns 14% annual profit (80% investors in range of 9 to 19%) for BSE 500 stocks if held for 5 years. For NIFTY 50 again this result is almost very close, so, we assume the result for top100 stocks should be the same. http://www.safetrade.in/NiftyAndAPS.aspx Our assumption is that the investor is in higher bracket of the income and pays 30% tax for any additional income. If such a person is investing Rs.50,000 in stock market under RGESS scheme, then Rs.25,000 (50% of invested value) of his/her investment will attract tax benefit which will be equivalent to Rs.7,500. Effectively the person is spending Rs.42,500 and buying Rs.50,000 worth stocks. Assuming his/her return will fall in 80% scenario of spot return then following will be the potential range of his investment value down the three years. Since, actual investment has been done with 15% discount (RGESS benefit), so effective return will increase by a factor of (1/0.85). Nevertheless, investors are going to get interest on their money in the range of 15.1 to 25.6% (median 20.3% and the chance to be in this range is 80%) We validated our result with raw data of NIFTY's 20 years value. Assuming 1st March 1993 as starting point and continued to invest in same way every month. First batch completed 3 years (lock-in) on 1st March 1996. Hence, in the next 17 years we would have a total of 205 such batches of investment. 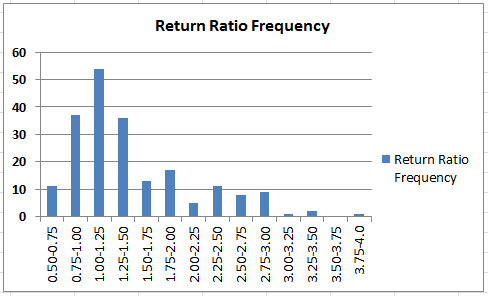 Following graph is showing return ratio (value at the end of 3 year/value at the beginning of the batch) of such investment batches. Median Ratio: 1.256 (equivalent to 13.9% return after tax benefit) 80% Range: 0.86 to 2.50 (equivalent to 0% to 43% return) Chances of making loss: 9% Maximum loss: 9% (During March 2000 to March 2003) Following graph is showing an alternative way to look at the same data. 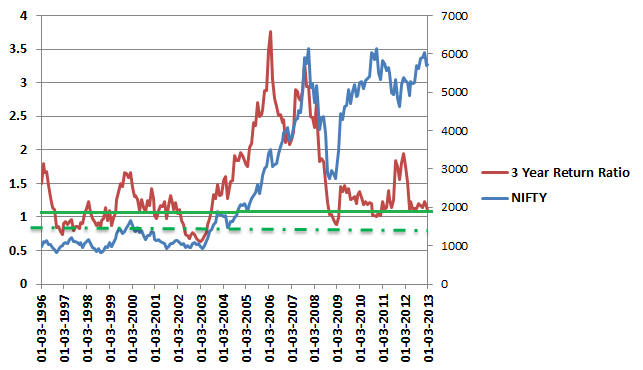 Instances when Return Ratio line (red line) has gone below green dash line are only when investors have lost money otherwise everywhere they have made profit. Instances which are above solid green lines have beaten return from fixed deposit (post tax).